Not always in the starting 11 in high school, Steve’s choices of college were few to none, so on to Forest Park Community College and the rest is Hall of Fame history. In his first year making JCAA All-American, it was on to Florida International for the next three years with All-American honors in 1994 and 95. Drafted by the Tampa Bay Mutiny in the newly formed MLS, Steve was part of the Mutiny from 1996-2001 and was awarded Rookie of the Year in the inaugural season 1996 and 1999 Team MVP, MLS Best 11 in 1999 and 2000, All-Star honors in 97 and 2000, MLS Fair Player Award in 99, 2000, and 09 and the team was awarded Supporters Shield in 1996. Recipient of the Keough Award in 2006. Then 2002 took Steve to the New England Revolution being awarded MVP in 2004 and 08, another MLS Best 11 in 2002, MLS All-Star in 02,07 and 08, and the Team were finalists in 02,05,06 and Champions in 2007 and North American SuperLiga Champs in 08. Steve holds the MLS records as the all-time career leader in assists (135), appearances (378), starts (372) and minutes played (33,143) and U.S. professional appearances (412) in 2010. As a U.S. National Team member from 1997-2009 Steve received 36 Caps while winning the CONCACAF Gold Cup Champions in 05 and 07. Remaining in the game, in 2010, Steve was player-assistant coach with the St. Louis AC, then assistant from 2010-14 found him with the Houston Dynamos, and currently is an assistant with the San Jose Earthquakes in the MLS. An interesting piece of Steve’s illustrious soccer career is that before taking his skills to the outdoor game with the Tampa Bay Mutiny, his First Professional Contract was with the 1995-1996 St. Louis Ambush in the NPSL Indoor League. 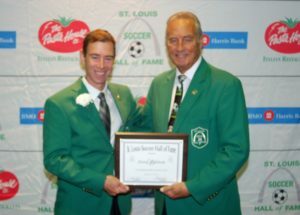 Thanks to Brian Roth and the staff of the St. Louis Ambush for this piece of St. Louis Soccer history on Steve Ralston.